Creating a stunning, interactive flip fold album can now be accomplished quickly and with ease! Beginning with an already constructed album takes the work and worry out of the building process and allows you to delve straight into the fun portion of the decorating process. Paired together with our assembled flip folds and pockets, you will find yourself quickly on the way to creating amazing heirloom pieces for yourself or gifts for friends and loved ones that are sure to be enjoyed for years to come. The choice has been left up to you to add as many flips, folds, and pockets as you like, or simply to leave the album more basic and just embellish it using beautiful paper and a few dimensional flowers, guaranteeing that no two albums will ever be the same. This set of dies are a part of the Burst of Splendor Collection and pair with the Bold Leaf Cling St.. Celebrate new beginnings and the awakening of nature with the regal, trumpet shaped lily flower. Fou.. Both stylish and elegant, the differing styles of rose blossoms found within the Blushing Rose Swirl.. Always ready to lend an ear, shake a paw or fix life’s problems with a slobber filled kiss, our four..
Delicate and dainty, these graceful drooping florals are the perfect addition to any fairy garden th.. Imagine a tiny fairy village where wildflowers and mushrooms bloom, fancy and decorative cottages li..
Lovely rose clustered embellishments featuring open blossoms, delicate rose buds and swirling foliag.. Creating dimensional flowers has never been easier. The Arianna Blooms die is designed to cut 5 flow..
Take time to smell the flowers! This ingenious set allows you to stamp 5 beautiful Arianna blooms at.. This set is part of the Balmy Breeze Collection.Approx. Image Sizes:1. Lighthouse: 2.5" x 2.5"2..
Vintage elegance meets ingenious design in this superb decorative die. Delicate latticework fills th..
Every woodsy forest scene calls for those little adventurous touches and wildlife surprises that you.. Taking the path less traveled often fills one with a sense of adventure and wonderment as you antici.. This set is part of the Old English Garden Collection.Approx. Image Sizes:1. Just Thinking: 3" .. This die is part of the Sun Kissed Fleur CollectionThis is an exclusive Heartfelt Creations Die that.. This stamp set is part of the Sun Kissed Fleur Collection and pairs with the Sun Kissed Fleur D..
A wispy spray of Baby's Breath will find a home in dozens of floral projects. A tiny cluster of popp.. Create realistic and life like chrysanthemums for your very own charming garden themed paper crafts .. The amusing antics and light-hearted play displayed by frolicsome pooches remind us that life is fun..
Add a touch of fun and charm to your paper craft creations with the Paw-fect Pooches dies! When pair..
No coral reef would be complete without the alluring charm of the graceful inhabitants that call it .. Create a moist, toadstool laden habitat perfect for shielding tiny Froggy friends from the elements ..
Bring one of nature’s most fascinating and mesmeric gems to life on all of your garden themed projec..
A sparkling poinsettia wreathed by elegant swirls and petite holly leaves is accompanied by an elega.. Graceful, winding rose filled vines are a breathtaking sight that call for one to slow down, linger ..
Design and establish astonishing views with the elegant and decorative Botanic Window Die. This intr.. Break out your fashionista side and "Let's Celebrate Beautiful"! This fun and flirty background sent..
A fun, furry friend birthday greeting is an adorable way to let friends and loved ones know you have..
Deck the halls with Sparkling Poinsettias and festive holly leaves that will never wilt or fade! The..
Breathtaking in bud form or as a magnificent blossom, the rose is a flower that calls for you to pau.. Create elegant, classic rose buds or flowers in various states of bloom as beautiful as those found .. This translucent vellum is ultra smooth, perfect for embossing and layering in scrapbooking, stampin.. This set is part of the Burst of Splendor Collection and pairs with the Classic Leaf Die.Approx.. Darling is simply the best way to describe the pixie fairies found within Wildwood Cottage! These li.. Create gentle waves of realistic, hand shaped petunias with the Classic Petunia Cling Stamp Set! Sub.. Whether found in hanging baskets or trailing from blossom filled decorative planters, large floral a.. Whether found in cascading wire baskets, overgrown decorative planters or a simple flower bed, the e..
Vining roses creeping along majestic brickwork or entwined on pretty picket fences are a sight that .. Create flowers that never fade with the Delightful Daisy Die. Designed to cut 7 perfect flowers .. Create delightful daisies in all shades and sizes with this realistic stamp set. The delightful .. Detailed vining, flower filled lattice-like corner pockets are quick and simple to create using th..
Add a hint of regal and majestic grandeur to your next creation with the swirling and intricate ..
Add a touch of classic romance to any paper crafting project with either of the gorgeous, exquisitel.. Wedding bells are ringing and there’s an excitement in the air! A classic and timeless symbol of mat.. Whether found in hanging baskets or trailing from blossom filled decorative planters, large flor..
Sending the perfect well wishes to those special couples in your life celebrating an upcoming weddin.. This set is part of the Sweet Serenity Collection.Approx. Image Sizes:1. Covered Bridge: 3.5" x.. The road to a friend's house has never been more beautiful! This ornate vintage postcard stamp featu.. This assembling of classic style border dies ranging from basic patterns to more fanciful will open ..
Bring a feeling of tranquility and a touch of nature to your Yuletide or winter themed projects with..
Add a hint of country charm to your paper crafts this holiday season with an endearing illustration ..
Sleigh bells ring out and cardinals sing, announcing that the Yuletide season is about to begin! Bri.. Perfect for adding a hint of country flair to all of your Christmas or winter themed creations, the ..
Give your “holly-day” paper crafting projects a traditional and old fashioned feel this Yuletide sea.. Spruce up your holiday themed paper crafts and add a hint of nostalgia with a wonderful assortment o.. Stamp and create your very own woodsy wonderland landscape using this stunning assortment of detaile.. The heart is always tugged by the thrill of the promise of adventure as you wander into a woodsy won..
A delicately scripted birthday sentiment surrounded by stately orchid flowers and diminutive humming..
A quaint and uniquely shaped flower filled basket, accompanied by a lovely illustration of a pan flu..
Glistening silver bells draped with festive holiday greenery are ready to ring out the sounds that i..
Add an elegant sentiment to all of your wedding or anniversary themed cards or scrapbook layouts usi..
Large Elegant Word BackgroundApprox. Image Size:4 1/2" x 5 3/4"This Cling Stamp is ready to use with..
Uplifting Scriptures Cling Stamp SetApprox. Image Sizes:1. For He Loves Us: 1 1/4 x 1 3/.. This set is part of the Balmy Breeze Collection Collection. Approx. Image Sizes:1. Large A.. This generously sized collage stamp combines a detailed drawing of a tall ship in full sail upon the.. This detailed collage stamp combines a vintage globe resting upon a map of the ancient world with an..
"You stood the test of time with honor, integrity and commitment. 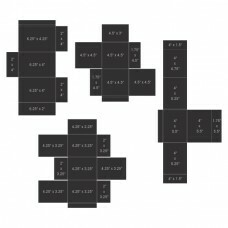 You are my Hero," is the Heartfelt..
Make a bold statement on your cards and layouts with this inventive set of 4 stamps. When combined w.. This versatile stamp set is sure to inspire! Five Heartfelt sentiment stamps pair with the arrow/ban..
Give your craft projects the cutting edge they deserve with this innovative and versatile set of 5 d..
You can almost hear the angels singing amidst the lavish Cascading Fuchsia blossoms that adorn this ..
Creamy whipped topping, along with beautifully illustrated latte froth so realistic in design make t..
A warm, summer sun filled day always calls for a chilly treat, and is especially delicious when shar..
A summer afternoon drive leads you down country roads to a fresh berry stand flaunting the most heav.. Create elegant, super dimensional, life like flowers using thin and lightweight Art Foam Paper! Stam..
Pleasantly charming and downright irresistible, the playful pooches found in this adorable cling..
Full of fun and a touch of mischief, our happy little friend has a rumbling in his tummy that could .. Create lacy accents to beautify all your projects with the 5 dies in this collection. Two lacy dies .. Beautifully illustrated and ideal for showcasing your wonderful coloring skills, this showy orchid c.. Beautifully ruffled in elegant layers, the gentle, unassuming and ever popular carnation flower is a..
Small, round, pearl-like accents for all arts and crafts! Adhere with any clear drying adhesive or t..
Softly falling rain, beckoning puddles, and strolls around the flower garden to take in the first bl..
Decorate your holiday and winter themed handmade paper projects with the traditional Christmas poins..
Petunia laden hanging baskets are certainly among one of the favorites with summer gardeners. Lush d..
Charming and ever so sweet, the darling illustration of a lovely cardinal couple perched outside the.. Beautifully illustrated and substantial in size, the charming pair of tropical birds featured in the..
Share your love and affection with friends and loved ones with an elegant rose themed creation featu.. The Nuvo Embellishment Mousse is perfect for highlighting your artwork with smooth metallic details ..
Opaque embossing powders add color and shine to any stamped images. Perfect for Fran's Painting with.. This Aged Ivory Embossing Enamel is a chunkier, vintage-inspired embossing powder that works great w.. This ultra-fine, transparent glitter has a luminous yellow/orange sparkle that will add the perfect .. This ultra-fine, transparent glitter has a radiant sparkle that will add the perfect finishing touch.. This ultra-fine, transparent glitter has a warm radiant sparkle that will add the perfect finishing .. This ultra-fine, transparent glitter has a luminous pink sparkle that will add the perfect finishing..
Vintage Glass GlitterComes in a 1 oz jar.. Elements are organic components, grown or produced by Mother Earth and manipulated into a variety of..
Use Gala Glitz to achieve new depths of sparkle and dimension! A perfect blend of stylish..